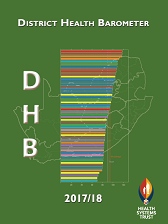 Health Systems Trust (HST) has released its 13th edition of the District Health Barometer (DHB) the Distirct Health Barometer 2017/18. The DHB provides a detailed overview of the country's public health services in all 52 health districts. The publication has become an important planning and management resource for health service providers, managers, researchers and policy-makers in the country. The DHB also serves as a tool with which managers in the health sector can monitor and evaluate not only trends in health status and service delivery, but also the underlying quality of routinely collected health information in South Africa. "A new development in the previous edition of the DHB was the alignment of the format of the district chapters to the District Health Plan (DHP) template of the National Department of Health (NDoH). This has considerably assisted district managers in the development of their DHPs and improved the efficiency of the planning process. These enhancements will contribute to a more efficient planning process in the districts and enable district managers to spend more time on the development of action plans to address the challenges and needs in their respective districts. We are grateful to the NDoH for their continuing financial support and collaboration, since without their invaluable contribution this important publication would not be possible." Read more on this year's DHB here. The indexed listing of individual chapters is available here. Follow this link for the full PDF of the DHB 2017/18.